VJ’s Auto Service in Arcadia, CA is a facility full of highly-qualified auto techs. At any time, we’ll have over 150 years of combined automotive service experience working on a car, truck, SUV, boat, or RV. So rest assured, our Master Technicians have your vehicle covered. We’re always raising our standards to the next level in quality auto repairs and services. That means we stay abreast of the latest technologies and apply the newest service techniques. Your vehicle has a variety of systems controlling many complex components, and it takes one of our ASE Certified technicians to repair, replace, and service them correctly. Our state-of-the-art facility is Auto Club Approved, which means our technicians and our services meet the highest standards. That goes for our tools, equipment, maintenance, repairs, and even our recycling. Yes, we’re saving vehicles while saving the planet! You can call us environmentalists if you like. But we just care about the environment and that includes you and your vehicle. Nothing is wasted at our facility, as we strip all precious metals from batteries and recycle all scrap metal. Engine oil is reclaimed and used in offshore ships for fuel. We’ve also turned our shop into a waste oil center. Our technicians always properly dispose of engine filters to avoid needless pollution, draining oil, transmission, and fuel filters and shredding them. All of our customers’ auto air conditioners contain Freon that needs to be evacuated, tested, and recycled. VJ’s Auto Service goes the extra step to be the most responsible repair shop we can be. Floors are cleaned and mopped so no oily water runs into the storm drains. We’re careful to keep our facility safe and clean at all times. Stop By VJ’s to Meet the Experts! We maintain the same commitment to excellence for all of our services. Whether it’s routine maintenance services or complex transmission repairs, we pay close attention to detail. Our team handles all vehicle makes and models, including RVs, boats, and motorhomes. Your trust is the most important part of the auto service process, and we go above and beyond to meet and exceed your expectations. 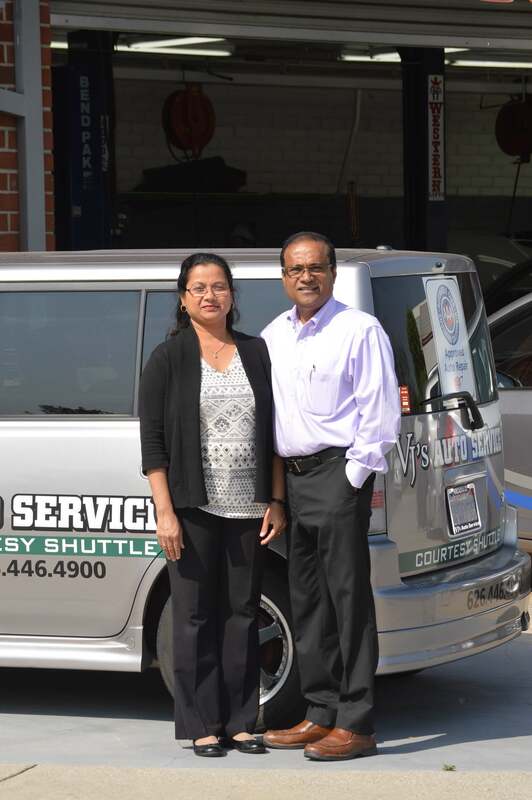 We also make your service experience as convenient as possible with amenities like a local shuttle service, free local towing, and discounted rental cars. Visit VJ’s Auto Services to get put on an effective service plan that keeps you on the road or in the water. Let us prevent costly repairs and unexpected breakdowns. Give us a call today at 626-446-4900 to schedule an appointment. You can also save time by using our convenient online scheduling system. Next time you’re in the area–400 North First Avenue–feel free to bring us any questions or concerns.